On 12 April 2015, we announced with great sadness that Marc Naimark is no longer of this world. As a tribute to all of Marc’s work for the LGBT sport and culture community, a Gay Games Scholarship Fund has been established in his name. Donations in Marc Naimark’s name can be made to the Marc Naimark Scholarship Fund.Proceeds from the Marc Naimark Scholarship Fund will be awarded to deserving applicants wishing to attend 2018 Gay Games 10 in Paris. Questions: email Emy Ritt. Since Marc’s involvement with the Gay Games in 1998, we have had the privilege to witness his kindness and compassion, his brilliance and genius. 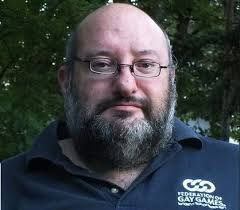 Thanks to his diligence and patience, FGG and the Gay Games benefited from so many of Marc’s ideas and initiatives. Unbeknownst to us, the ever-present kindness and compassion that was Marc’s trademark masked a tortured soul, even from his loved ones. Although his chair at the table is now empty, as our hearts are, we know that Marc has moved onwards and upwards to a better place. Our thoughts are with Jimmy, his partner of 10 years. We will keep you informed of any further news and thank you for your compassion.